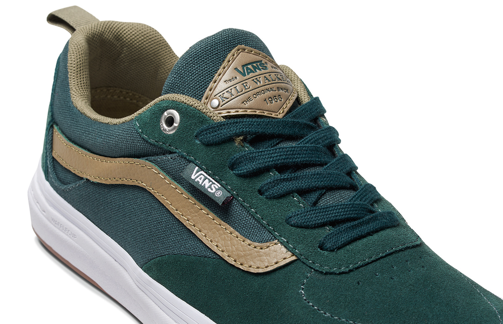 On the heels of pro skateboarder Kyle Walker's signature pro model debut, the Vans Kyle Walker Pro continues to push skateboarding forward with Vans' latest performance innovation and the industry's first-ever vulcanized cupsole. Returning to shops in brand new colorways for the holiday season, the Kyle Walker Pro features Vans' revolutionary WAFFLECUP technology, offering the best of both worlds in skateboarding—the support and stability of a cupsole shoe without sacrificing any of the boardfeel and grip for which legendary vulcanized Vans skate shoes are known for. The Kyle Walker Pro featuring Vans WAFFLECUP provides skateboarders with superior levels of cushioning and durability from Vans ULTRACUSH HD sockliners and Vans DURACAP rubber underlays in high-wear areas.